We are glad to inform that according to the decision of the Attestation Board dated 23.10.2018 and the order of the Ministry of Education and Science of Ukraine №1218 dated 07.11. 2018, the Ukrainian Physical Journal has been assigned the category "A" in the list of professional editions. Read More Read more about For Authors! Scopus UJP Data of Citefactor 2017 is 0.3; SNIP 2017 is 0.358; SJR 2017 is 0.182; h-index (data of 2017) is 12 (more...). 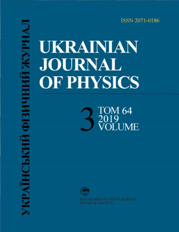 Ukrainian Journal of Physics is the general physics edition of the Department of Physics and Astronomy of the National Academy of Sciences of Ukraine. The journal publishes original papers and reviews in the fields of experimental and theoretical physics; research on particle physics, nuclear, atomic and molecular physics; research on optics and quantum electronics, gases, plasmas, condensed matter physics, statistical and quantum physics and nanophysics. and Vernadsky National Library of Ukraine (http://www.nbuv.gov.ua).